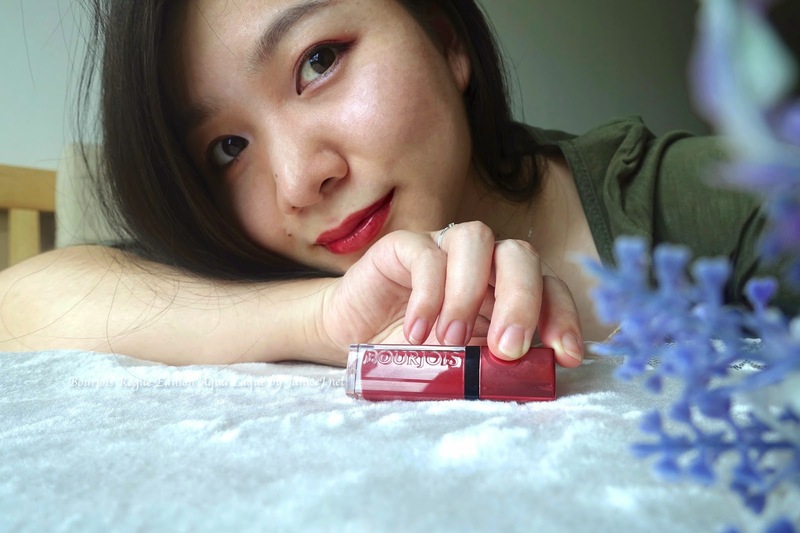 Days ago I received the Rouge Edition Aqua Laque from Bourjois ♥ and frankly speaking, I can't wait to try it out! I have never try products from Bourjois. I am just not that into drugstore cosmetics, they usually end up in my "ignore basket" where there are products that I just do not feel like using them everyday. These products will usually go off, to friends or family members if they are not expired when they gets back my attention. It is just inside my mind that since they are cheaper they will be drying, or not as good to apply on my face, lips, eyes. Another mindset would be, they are not that expensive that I need to finish them up. There is no urge to use them off. However, recently I am more open towards these brands as I do noticed that that are drugstores cosmetics or skincare that are good enough and save me pennies. My personal favourite would be the Biore Daily UV care gel and Peripera's lip tint and eyeshadow Frozen collection. For makeup removing, I would recommend the Nivea 3-in-1 Makeup Removing Sheet and Canmake cleansing stick. Back to my topic, lets see if the Aqua Laque goes to my recommendation list or the "ignore basket". The drama of a lipstick but the light like a gloss. The drama of a lipstick but the light like a gloss, the statement gives an idea of what the lipstick promises. Bourjois Paris, is a French private cosmetic company that first launch their products in 1863. I am not surprise that it was brought into Malaysia because.. why not? It is affordable, has great history and are constantly producing cosmetics following the trend. So what we have here is the latest rouge edition aqua laque. Shiny gloss and water-like feeling that gives people the plumped lips look. I definitely love the texture, it is watery enough on lips, not sticky (+1) but it doesn't go runny like water. 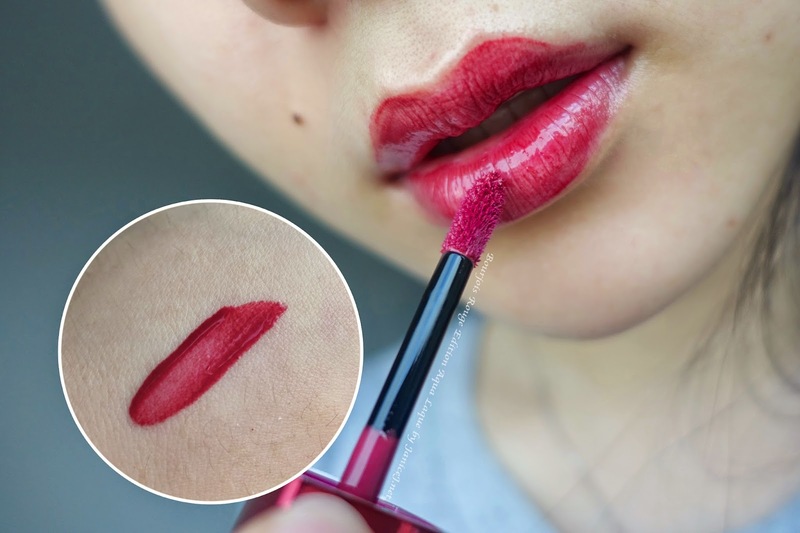 It is similar to most lip tint in the market. It claims to be lightweight and fresh feel which I agree. The product smells normal, to me it smells like cherry. 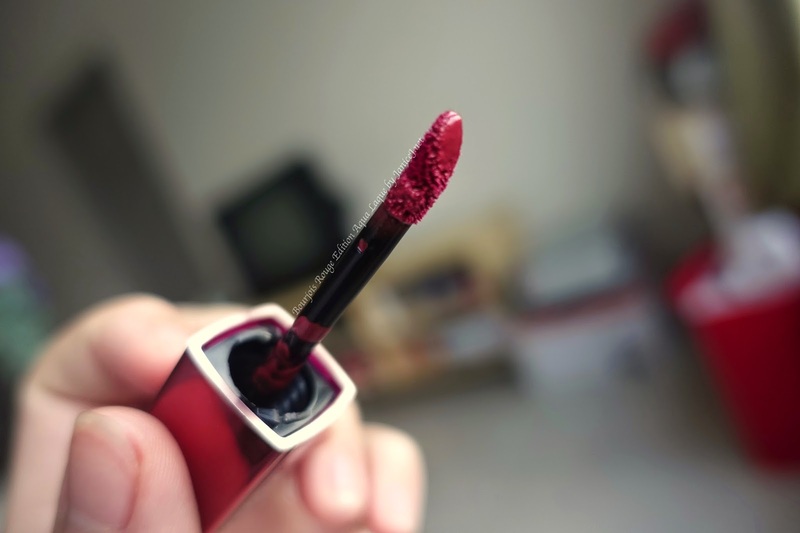 However, since the colour that I got is 03 Brun'croyable (it looks just like this colour before application), a cherry plum red, it is not thick enough and create a hard for an even application. 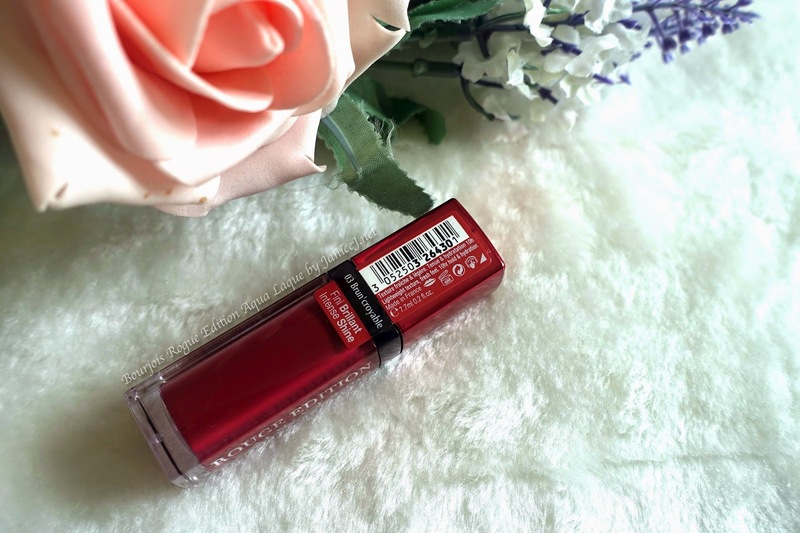 It is rather sheer and I would recommend getting the lighter colour if you want to use this as everyday lip colour. Not sure if I am destined to wear red lips but i have a lots red lipsticks, and this is another one that is given at random to me.. Well.. 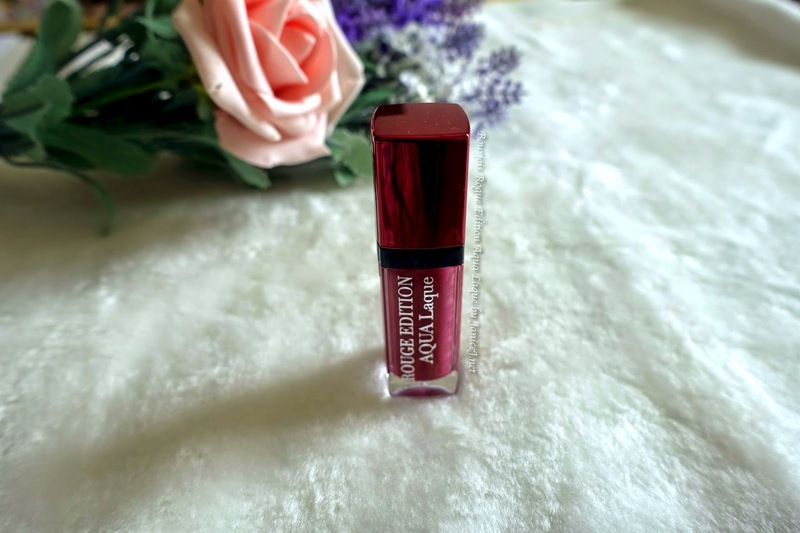 The tube is not too big nor too small, just like other ordinary lipstick. It contains 7.7ml of products that can last you 6 months after opening. It does not feel cheap on touch and is considered rather attractive. I placed it on my table and I get people asking me bout it and it definitely looks more than what it cost. The application head is approximately 45degree, and is soft. 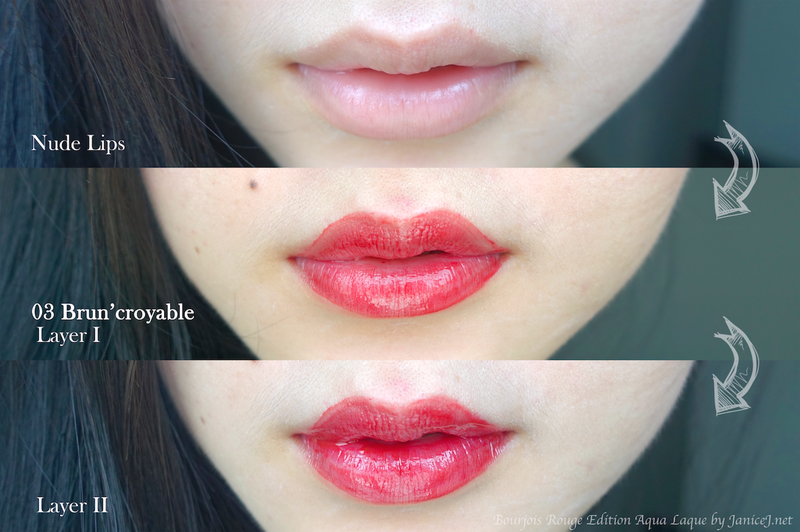 However, there is no fancy shape or angle like those in higher end lip tint. However, I personally do not like the Rouge Edition: Aqua Laque font on it. I feel that it will look better if the font is smaller. There are no additional packaging or boxes. Simple and environmental friendly. The colour looks really warm under striking sunlight. These photos were taken indoor right in front of the window. Under natural light, it appears to have more purple tint and is closer to the colour from the tube. I bet you have already noticed the gloss. That is my favourite part of the lipstick. You will not need to apply any lip gloss after this. On the down side, the tint appears uneven on the lips. You will find the product build up on the edge of the lips. Other than that, it does not really last and will goes off with one wipe. 1. Cheap but does not feel like. You can get these from Watson or Bourjois kiosk, Sunway Pyramid at retail price of RM45.50. Pick from total of 8 shades. For more information, visit Bourjois Facebook Page.